In his bestselling book, The Hidden Life of Trees, Peter Wohlleben revealed the fascinating magic and mystery of trees. He spent his childhood close to nature, where he was fascinated by the family of life. In his adult years, he has been a forest manager in Germany, continually striving to nurture the health of the land, and minimize harms. He has spent much of his life outdoors. Consequently, he has developed a perception of reality that is quite different from the herd. 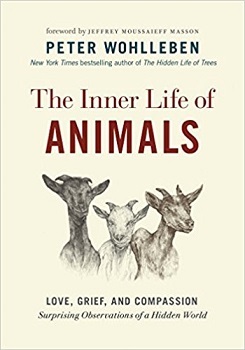 In his new book, The Inner Life of Animals, he directs his attention to animal life, which is also little understood by mainstream society — the folks who spend most of their lives in climate controlled compartments. For them, the natural world is often just a meaningless blur of scenery along the freeway, and wildlife sightings are mostly on glowing screens. The new book is a pleasant voyage into a kinder and gentler mindset. Readers are served a banquet of interesting ideas, mostly. Wohlleben is a caring man who wishes that humans would cause far less damage and suffering in the world. That’s his message. 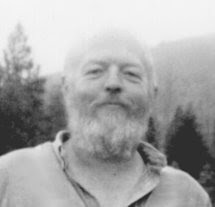 At his home in the woods, he keeps goats, horses, rabbits, dogs, and chickens. He apparently treats them with kindness until they drop dead from old age, or become terminally ill. He confesses to drinking goat milk and making cheese, but says not a peep about meat (a touchy subject these days). He detests factory farms, hunters, and industrial forest miners. He has a deep appreciation for the coherence of wild ecosystems, and the remarkable relationships that coevolution has produced. A primary focus of his book is to confront the cult of human supremacy. Like patriarchy, and get-rich-quick fever, human supremacist beliefs intensify the madness of modern society. The cult asserts that anything non-human is below us. It’s perfectly OK to cram 20,000 chickens, shoulder to shoulder, inside a metal shed, without guilt or shame. They are mindless machines that can feel no pain, organisms incapable of thoughts or feelings. Supremacism has left a boot print on the English language. Throughout the book, there are two categories of critters, “humans” and “animals,” implying that humans are not animals. Of course, that’s not true. Take off your clothes and look in a mirror, and you will see an animal that looks a lot like a chimp or bonobo, our closest living relatives. In the mirror you will see a furless tropical primate that evolved an upright bipedal stance fine-tuned for long distance running. This enabled us to survive via persistence hunting — chasing animals across the savannah for hours, until they collapsed from exhaustion. Louis Liebenberg wrote about this. Our ancestors have been hunters for several million years, long before we became Homo sapiens. As every gardener knows, our bodies are poorly designed for gathering seeds, nuts, melons, and berries — too much bending and backaches. Wohlleben hates hunting, which in its current form is “no longer appropriate.” During the season, the woods are crowded with hunters, hiding close to bait piles, with high-powered rifles. Bullets are whizzing all over the place, and up to 650,000 wild boars die every year. Some animals are merely wounded, and suffer agonizing deaths. He doesn’t describe what “appropriate” hunting would be. Society has vigorously exterminated wild carnivores, whilst growing staggering amounts of boar food. Is boar overpopulation appropriate? Wohlleben owns a number of domesticated animals, and they spend their days in locations enclosed by electric fences. They cannot go where they please, and the fences discourage the indigenous wild lynx from dining on his exotic invasive critters. This disturbs him a bit. “Nature didn’t intend for goats and horses to spend their whole lives as prisoners behind a fence. Let’s not pretend: these animals would hightail it in a heartbeat if they could.” (Did nature intend the existence of domesticated animals?) The best he can do is treat them respectfully. He lives in the twenty-first century, when many people own domesticated animals, a source of wealth and status. For these folks, wild predators are evil. Chickens are fox food, and foxes are demonic anti-capitalist anarchists. Many also plant large fields of boar food, and get quite upset when boars come to enjoy their generous offering. Some farmers surround their corn fields with electric fences to keep them out. In the good old days, before domestication, nobody owned the large game and edible plants. Nobody got upset when wild predators consumed wild herbivores, because nobody’s status was diminished. In egalitarian societies, all people were equal, and status consciousness was totally inappropriate. In The Others, Paul Shepard brilliantly described how important it is for all humans to spend their entire lives in healthy wild ecosystems, surrounded by many species of wild animals. He also explained the many ugly consequences of capturing, confining, and domesticating “goofies” and “hooved locusts.” Civilized primates are seriously deformed and traumatized by spending their lives in isolation from their wild relatives. It’s easy to gobble a Big Mac when you have been taught that animals are like rutabagas, dumb organisms. Now, we’re learning how sensitive and intelligent animals are. To complicate matters, in his tree book, Wohlleben revealed that plants are also not dumb machines. How can we feed ourselves in a morally acceptable manner? Chimps and bonobos happily beat small animals to death, eat them raw, with no guilt at all. A robin eating a worm is not evil. We all feed one another. Wohlleben is a fountain of stories. Foxes lie down, tongues out, and play dead to attract hungry crows. Goats move away from the herd when it’s time for them to die, because their corpse will attract predators. Hives of bees with insufficient honey for the winter will attack weaker hives, kill defenders, and swipe their stash. Swifts rarely stand on the ground, they sleep while soaring. The book is loaded with hundreds of anecdotes like these. I shall let you discover them on your own. According to the human supremacist myths, animals do not have consciousness, self-awareness, or emotions. They cannot feel pain, communicate, remember events, grieve, express gratitude, or recognize individual humans. Today, the core of the controversy over animal intelligence is whether or not they are capable of thinking. Humans, of course, can think like crazy. In our brains, the neocortex is the engine of self-awareness, consciousness, and thinking — and humans have the greatest neocortex of all. Oddly, while most of the book is dedicated to challenging human supremacy, Wohlleben refers to our neocortex as the “crowning achievement of creation.” Indeed, no other species is capable of experiencing so much cognitive dissonance. Folks who understand environmental history and ecological sustainability, and have learned how to engage in critical thinking, can readily detect enormous flaws in the core myths of our culture. The view from their mountaintop, far above the thick smog of dodgy beliefs, perceives that thinking is at least as much of a curse as a blessing. We can live without glowing screens, but we can’t live in a toxic wasteland, with a hostile climate. Supremacist myths trump common sense. You can lead the herd to the pool of knowledge, but you can’t make them think. Wohlleben, Peter, The Inner Life of Animals, Greystone Books, Berkeley, 2017.